The story of the Ffrenches in Ireland began in the 12th Century, when their ancestor came in the company of the Anglo-Norman nobleman Strongbow. Strongbow married the daughter of the King of Leinster, and eventually became king himself. He rewarded his loyal men with lands of their own, the Ffrenches settling in County Wicklow. It was not until the 16th Century that the family moved west and bought the lands of the O’Kelly family, building onto the fortifications of the O’Kelly castle and establishing Monivea House. By the late 19th Century the land was rich and productive, and another Robert Ffrench was employing the trappings of their wealth to extend his family’s high social connections, travelling round Europe and coming home with a Russian bride of noble blood. Robert had only one child, a daughter, Catherine/Kathleen. Catherine was a determined woman who never settled into the Victorian ideal of husband, home and hearth. 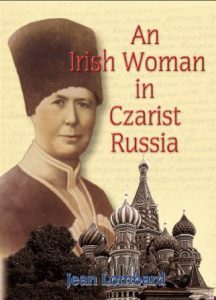 Instead, she took on the task of restoring her family’s Russian lands as her forefathers had restored those in Ireland. For many years she lived in Russia, organising the workers on her land, and gradually the estate returned to profit. But just as she was finishing her task there and beginning to reap the rewards, she almost lost her life in the Russian revolution. The lands were all seized, and in the end she was lucky to escape with her life. More information about the ffrench family.